the price-to-income (PTI) ratio to almost 30 percent above its 20-year average, with Stockholm’s PTI nearly twice the national average and among the highest worldwide. New purchasers must take on high debts relative to income (DTI), typically at floating rates, a macrofinancial vulnerability (…). Moreover, long queues for rent-controlled apartments meant that those unable to purchase housing had to pay much higher rents on subletted or newly constructed apartments, that are estimated to be 65 percent higher on average. An “insider-outsider” problem arises as labor mobility to the main centers is most impaired for those without parents able to assist with large down payments, impeding growth and exacerbating intergenerational and regional inequality. Making the rental market work: in addition to fully liberalizing rents of newly constructed apartments, there is a need to phase out existing controls. A common approach is to apply market rents when there is a change in tenant. Access to the housing allowance could be expanded to cushion this adjustment (see below), while also applying a temporary “windfall” tax on significant rental income gains. To help reduce market rents more quickly, rental supply should be increased, such as by reducing impediments to sub-letting and to households renting out their own apartments, while containing macrofinancial risks from buy-to-let housing. Taxing property to rebalance the housing market: Sweden’s property tax was capped in 2008 to be among the lowest in the OECD, limiting the cost to households of occupying housing beyond their needs. A broad-based increase in the ceiling on the property tax would be most efficient, but an increase targeted to the main centers could be considered to incentivize mobility where it is most needed. Abolishing the interest on deferrals of capital gains taxes will help ease deterrents to mobility. An additional step to be considered is to tax only a portion of the capital gains on primary dwellings. Implementing a phase out of mortgage interest deductibility—which boosts housing demand and prices—would have limited impact on household finances currently given the low level of interest rates. 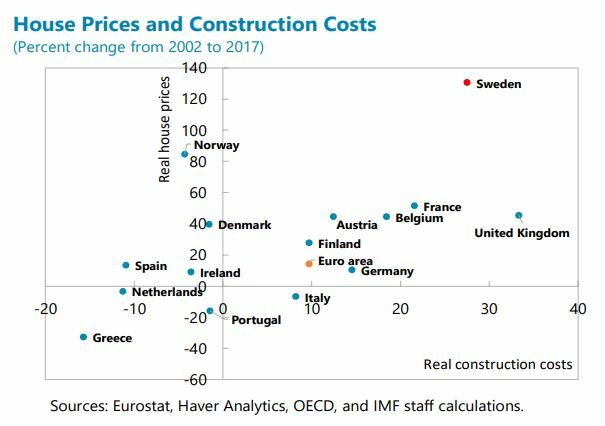 Producing housing that is affordable: it is important to simplify the planning process to reduce the cost of construction which have risen by over 28 percent in real terms over the past 15 years, compared with 10 percent in the euro area. Productivity in the construction sector should be enhanced by strengthening competition, including by harmonizing land sale procedures across the municipalities and preventing requirements beyond national building standards in the approval process. 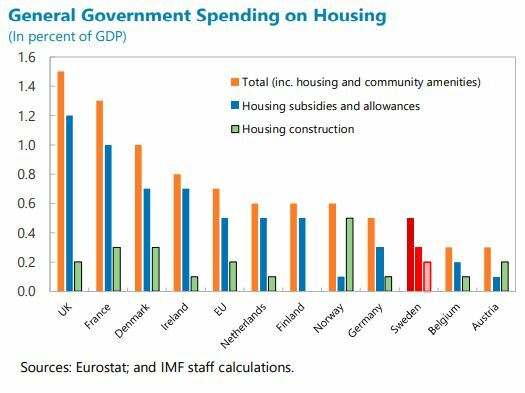 The government should also expand existing subsidies for construction of affordable rental apartments, together with those for student and elderly housing in view of changing demographics. Protecting households in the transition is important to help build broad consensus on comprehensive reforms. On average, the share of rental expenditure in disposable income would increase from 24 percent to 31 percent, with most impact on households in the lowest income decile, which could be cushioned by expanding payments under the existing housing allowance. 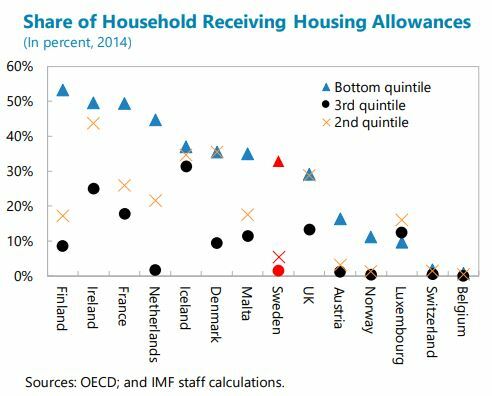 However, this allowance is seldom paid to households in the second or third income quintiles, contributing to relatively low total expenditure on housing allowances in Sweden. There is a need to review the coverage and amounts of housing allowances to give confidence that a transition to market rents will be manageable.